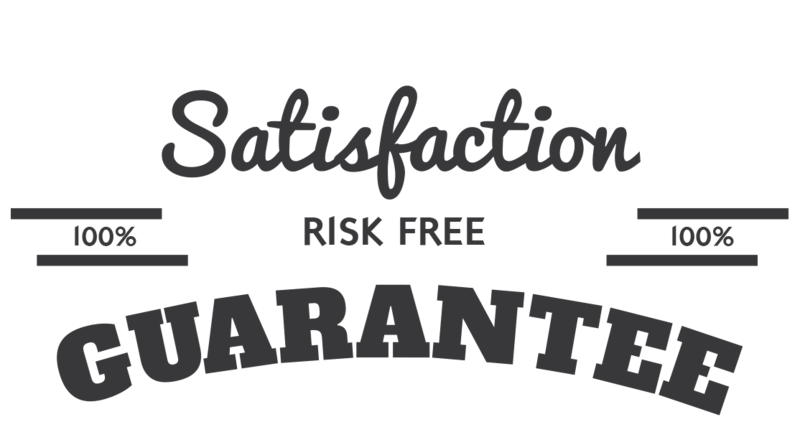 30 Day, No Questions Asked Money Back Guarantee. 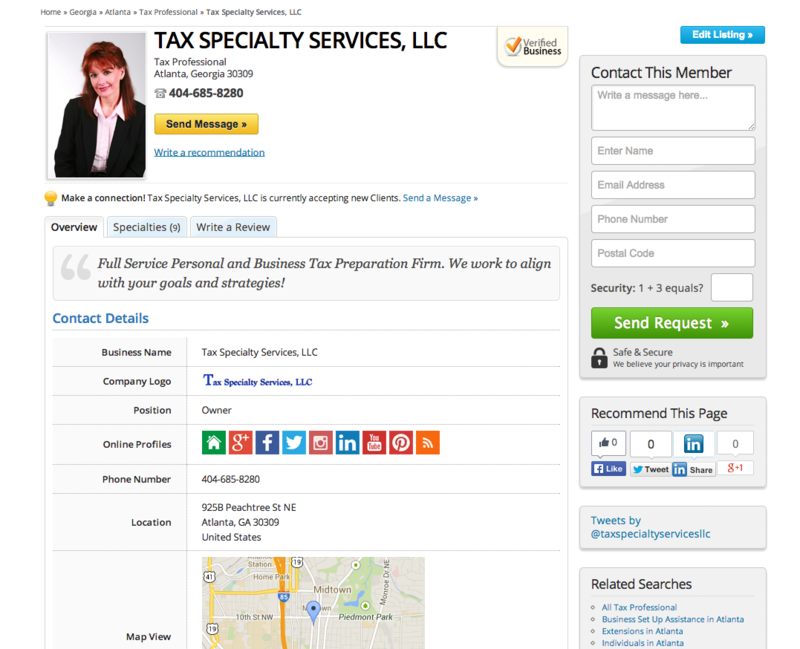 TaxProfessionals.com is an online directory that links taxpayers to Tax Professionals like you. This a new service has been designed to enhance your business by giving you unparalleled value with a modest investment. We have designed the service with your tax business in mind. 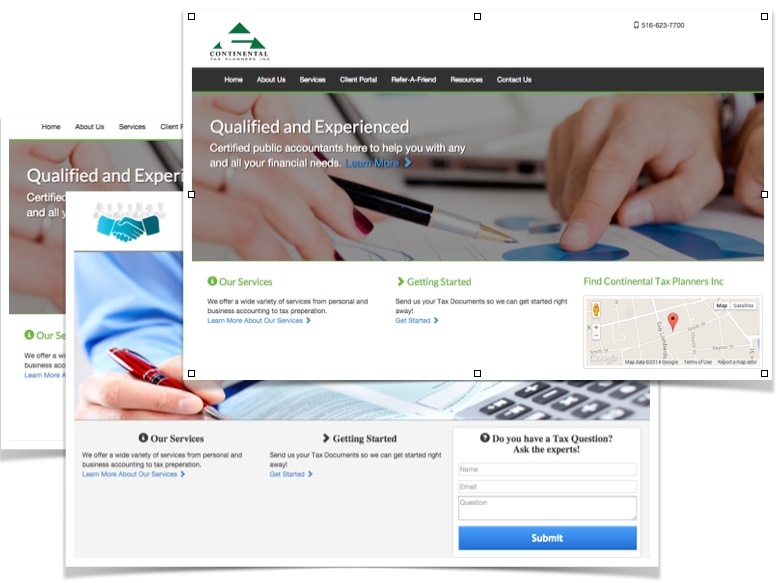 Our service includes a premier listing on TaxProfessionals.com, secure file transfer, merchant services, and a beautiful website that is installed on your own domain name. When taxpayers search common terms to find a tax professional, TaxProfessionals.com shows up in a high ranking position on Google. 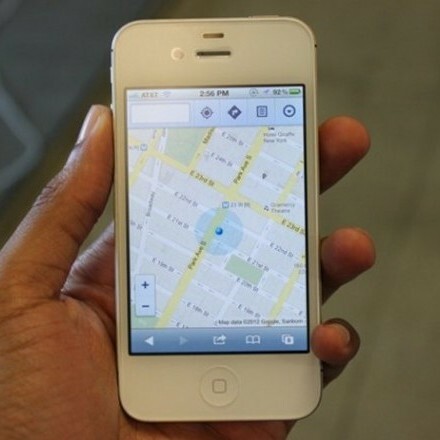 Your listing would then appear first based on your prospective client’s location. Google is estimating over 30 million searches by taxpayers looking for Tax Professionals between January and April in 2015. With that many people looking, it’s important that you can be found. Additionally, TaxProfessionals.com allows taxpayers to ask questions directly on our homepage; those questions, along with all of their contact information, will be sent to you based on location and category matching. Your listing is beautifully organized, extremely robust and interactive. The site allows you to link your website, get mobile directions to your office, list your phone number, make specialized coupons for new visitors on your profile, verify your account with us, and so much more. Be found online this and every Tax Season without the price ever increasing. Your listing is also designed to keep your current clients. Current clients can upload documents directly to you from their computer or mobile phone, get instant directions, or reach out to you anytime by calling your number. Finally, you will have the ability to blog on our Optimized Site giving your blog post a very high probability of landing on page 1 of Google. When visitors see your blog, they bypass all your competition and go straight to your profile. For a limited time, our experts at TaxProfessionals.com are going to train a small group of our members on how to write blogs that rank high on Google. We offer an ultra-simple and secure file transfer platform. Our platform is one the most secure platforms that you will find. You and your clients can upload non-editable docs (i.e. Picture files, PDF Files, etc.) to your portal. You can send documents directly to your clients with a password that you choose. 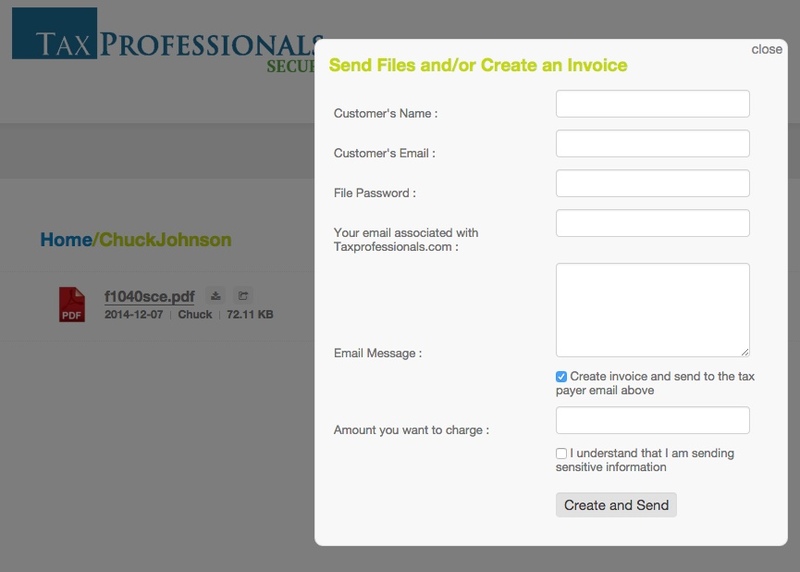 You can also check a box that says you want to get payment prior to clients downloading their documents. This was custom built specifically for Tax Professionals with ease of use and ultimate security in mind. 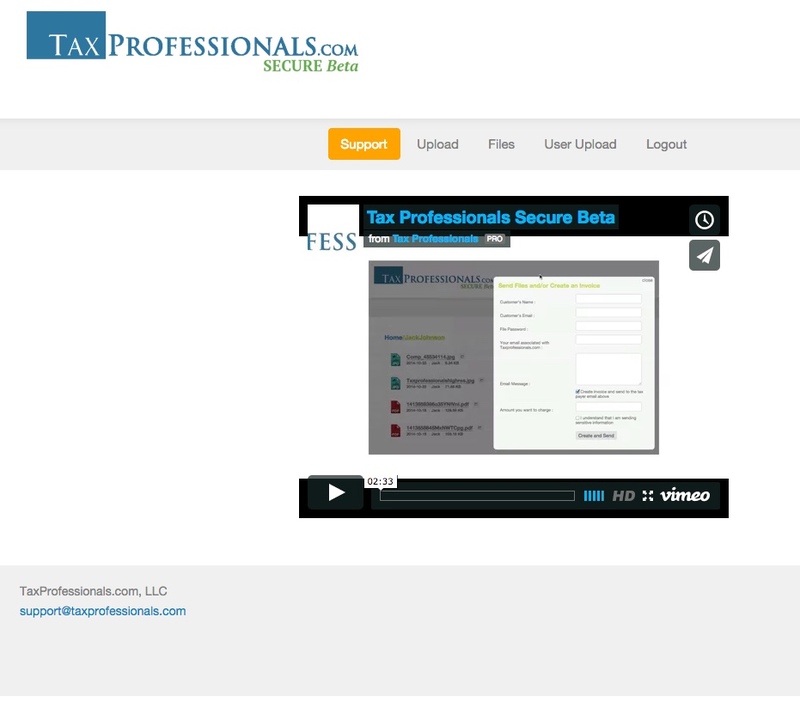 TaxProfessionals.com Secure is also certified Gramm-Leach-Bliley and HIPAA compliant (for ACA and Medical Records) giving you the confidence that you can tell your clients that their personal documents are secure. TaxProfessionals.com offers free merchant services with unprecedented rates. When you sign up for our merchant services, we will send you a credit card reader that works with all Apple and Android devices. When you use this reader, you are locked in to a low rate of 2.65% on all Visa, Mastercard, American Express and Discover charges. We also offer a Virtual Terminal and the ability to charge for a prepared tax return before your client can download it. Depending on the number of transactions you process, you can lower your rate even further by applying for our Professional Plan. We offer websites that are clean, easy to navigate, and most importantly designed to get visitors to take action and to become a client. Current clients will love your site because they can upload documents to you from their computer or mobile device. They can take picture of their W-2’s, 1099’s, etc. and send them directly to you from their mobile phone! We currently offer 4 different site designs with 4 different color schemes. 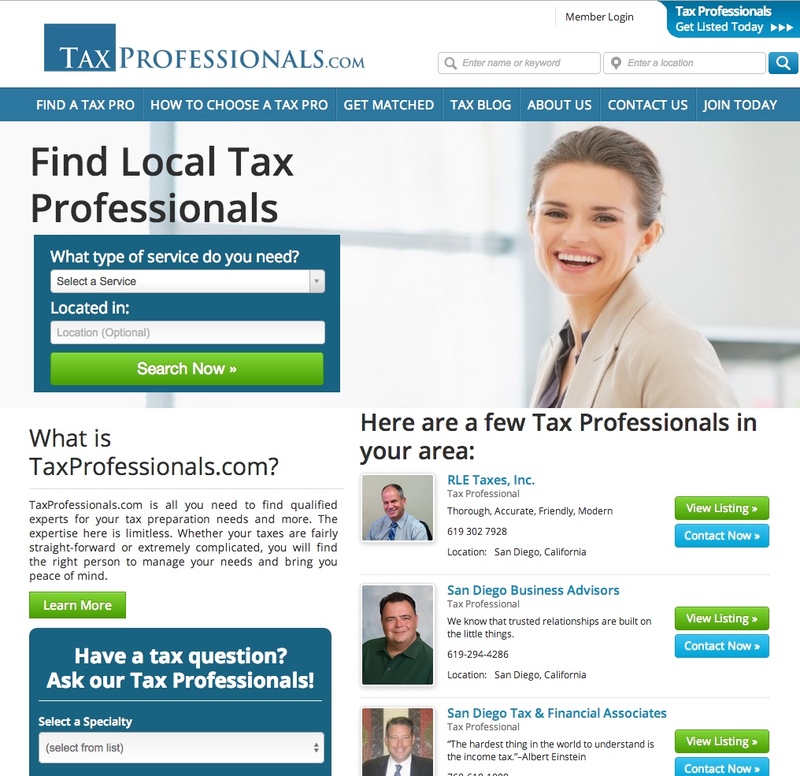 At TaxProfessionals.com we will update our site and continue to come out with new designs to keep and attract new clients. 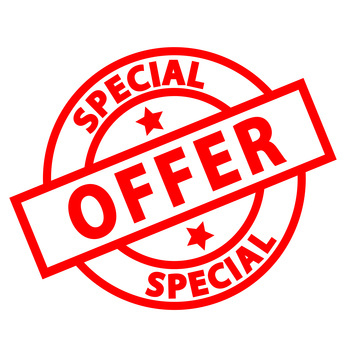 Included in your Platinum package is blazing fast hosting at NO additional charge. Your website will load fast every time to allow your visitors to quickly take an action on your site. The most powerful and effective online directory! Embedded Google Directions right to your office for new clients. Let them navigate right to you on their mobile device. 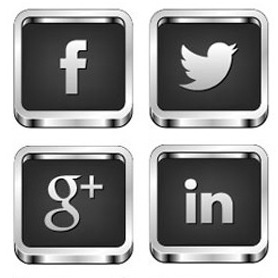 Link your website, Twitter Feed, Facebook Page, Blog, YouTube Page, Pinterest, LinkedIn, Google+ and even Instagram! 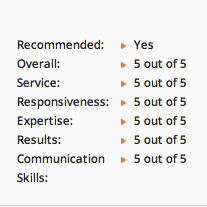 You can get your current clients to rate you. Bad ratings are kept off until it’s completely verified by us and you. Taxpayers from all over the country hit the site every day and ask questions on our home page. We route those questions to just a few Tax Professionals based on the categories and locations you select when you sign up. You receive an email with the Taxpayer’s question, phone number, and email address. You answer the question and earn the trust of the Taxpayer so they choose you as their Tax Professional moving forward. Create as many coupons as you want and make them shine by placing imagery and linking them to your existing site if you wish. 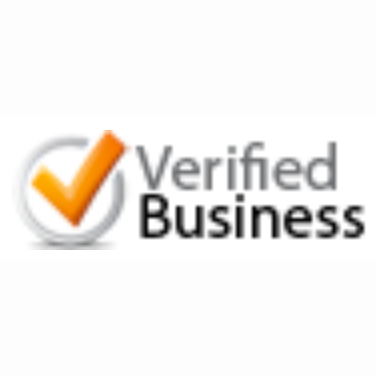 Fill out a short form and get a Verified Listing with us. Then earn Platinum Level, CPA and CFP badges. 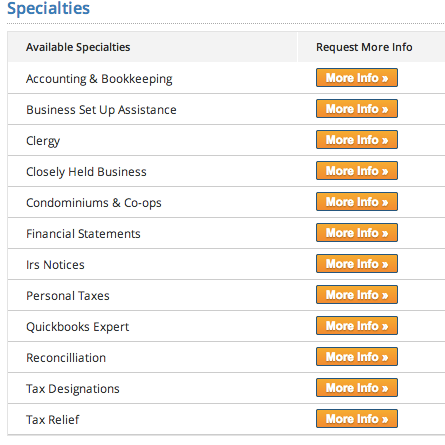 Prospective clients can see your specialties and request more info on a specific category. Requests come directly to your inbox. Powerful online directory is beautifully organized, extremely robust and interactive. Give prospective clients a way to read about you and reach out to you directly. 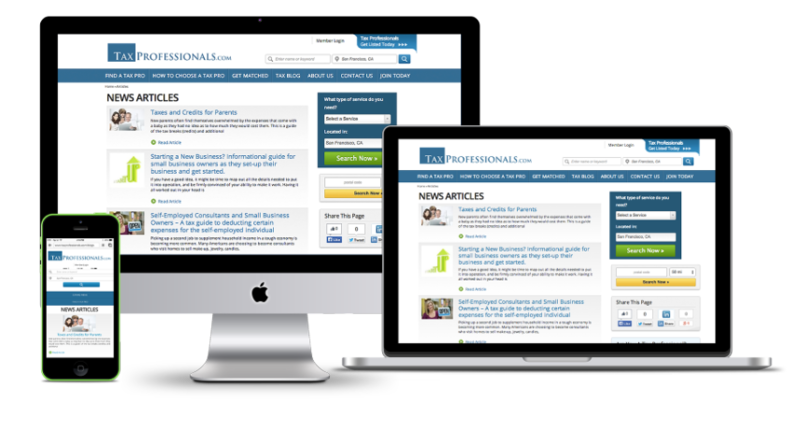 Small and Large Firms can own page 1 of TaxProfessionals.com with just your people. List the Associations and Memberships you belong to and where you’ve been featured in the Press or Magazines. Enter all of your qualifications including your tax designations, the year you started and anything else that will differentiate you and your business. Free Training on How to Blog the RIGHT Way When You Sign Up Today for Platinum! In this module we’ll give you a short background on blogging, why it’s a critical component to the success of your business, and how to get started immediately. Sometimes jumping in the deep end of the pool is the best way to get started. There are some very easy to use tools that we’ll go through and teach you exactly how to use them effectively. This exercise will literally tell you exactly what to write about and what words to use. This module coupled with the Keyword Research Module is the best 1-2 punch you could ever use. This exercise is like mind reading Taxpayers wants and needs and what they will spend the time to research and read. Spying and stealing are generally bad but Google and Bing give you the ability to quickly and effectively see what others are doing effectively and how you can steal valuable traffic from them. Google encourages ethical stealing and we’ll show you why, how and you’ll be able to sleep at night with a good conscious. Probably the most important part of blogging. Structure, keyword stuffing the right way, and length of the blog post is absolutely critical. You might want to skip right to this module if you’re ready to write now. This is CRITICAL. Now that you have the right content and topics, readability is next in line of importance. We’ll show you how to use our WYSIWYG editor (That stands for “What You See Is What You Get” by the way) to create beautiful looking and easy to read blog posts. How difficult is it to set up my website? Website set up is extremely simple and we walk you through the three simple steps during set up. Just click the website builder in your account profile to start the simple process. Customer Support is always available if you require additional assistance. How does your Merchant Services Work? If you pick a plan with Merchant Services included, we will mail you a free credit card swipe machine to be used with your Android or Apple Smartphone or Tablet. You can also take credit card payment over the computer or with our file transfer system (you can make your clients pay you before they get their files). Your client will see your business name on their credit card statement giving you ultimate professionalism! Can I get a lower transaction fee? Yes! You can apply with our underwriting team to reduce your transaction rate and move to our Professional Plan. Once you get your new rate, you can determine if your volume justifies moving to the new plan. Professional Plans only cost $10 per month. Is your file transfer system really that secure? We’re confident that you will not find a more secure platform on the market, no matter the price. First, our platform is Gramm-Leach-Bliley and HIPAA Compliant (for medical bills) and utilizes uncompromised security practices. Next, we require a password for each file that you send to your clients because email and hidden links can easily be hacked. Finally, we automatically remove files within 5 minutes of you sending or downloading files. Large corporations continue to get hacked so we don’t store these ultra sensitive files long term like many other portals do. You should store all client documents on site utilizing best practices for security. As we’ve seen in the news, the cloud or your internet connected computer is not safe for long term document storage. You can confidently tell your client that their documents have the highest security possible now. What do your website templates look like? Currently there are four to choose from. All 4 come with 4 different color schemes. We will be introducing more templates throughout 2015, so if you like one of our new sites better, we can switch it for you instantly. All of your content will move right over! What are the Merchant Service Fees? We offer a simple plan with no monthly fees. You will also get a credit card swipe machine at no cost. The rates are 2.65% plus $0.15 on transactions using the swiper and 3.3% plus $0.15 using the computer’s virtual terminal or our file transfer system. How does the file transfer system work? It’s ultra simple and ultra secure. You or your clients can upload non editable docs (i.e. Picture files, PDF Files, etc.) to your portal. You can send documents directly to your clients with a password that you choose. You can also check a box that says you want to get payment first. Just fill out how much you want to charge and you’re done. This was custom built specifically for Tax Professionals with ease of use and ultimate security in mind. I’m computer challenged, can you help me setup my profile on TaxProfessionals.com? Of course! But first, take a quick look after you sign up because it’s extremely simple to set your profile up. The moment you have a question, we have a wonderful support staff that is ready to help you. Just email us at support@taxprofessionals.com with what you want your profile to say. Attach your picture and/or logo and we’ll upload that too. If you need a call, just let us know when and we’ll call you when it’s most convenient for you. Customer Service is our first priority! Just email us at support@taxprofessionals.com, let us know what time you'd like to have a call, and we will promptly call you at our appointment time!